When music legend Quincy Jones turned 75, a few of his friends decided to pay tribute. This July 2008 Montreux Jazz Festival concert is the result, and the party is on the stage as a slew of musical greats team up for a soul-stirring serenade. Highlights include Chaka Khan and Patti Austin performing Miss Celie's Blues, Petula Clark singing One Mint Julep and Herbie Hancock bringing his signature flavor to Cool Joe, Mean Joe. *Artist: JONES,QUINCY *Genre: Music Video: Concerts *Rating: NR *Release Date: 21-JUL-2009. There's no greater feeling than getting the perfect item with the most features at the lowest price. 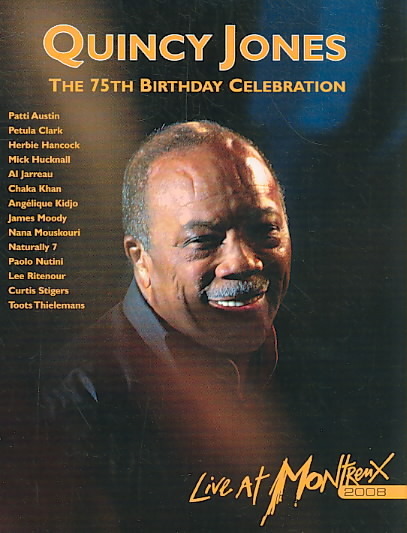 When you purchase this 75TH BIRTHDAY CELEBRATION:LIVE AT 08 BY JONES,QUINCY (DVD), you can be confident that you've found the best deal available online. Right now, our everyday price of $24.00 is 5% off the list price - a savings of $1.20! If you would like to track the status of your order, you may do so on our Order Status page using our ZIP code and order reference number. At UnbeatableSale.com we are committed to protecting the privacy of our customers and using personal information responsibly.